The Navratri festival is the nine days celebration to honor the very soul of the universe – The divine feminine energy/the holy mother. Navratri is not just a time to celebrate, but to live in AWARENESS of the Supreme Consciousness. It is the time for self-development with a strong sense of righteousness, self-purification and self-transformation,so we can receive Mother Goddess’s Grace, Her Love and experience Her Divine Anandam Energy. 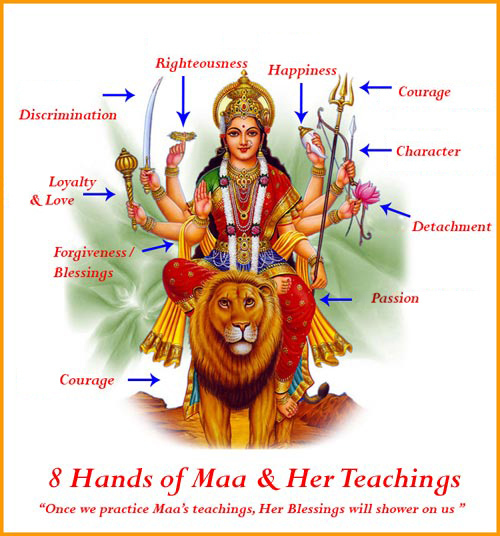 For nine days, we can embark on the spiritual journey to cleanse our body and mind (eradication of the negative tendencies of our body, mind and heart)by self-disciplining in daily activities and praying to Goddess Durga to replace our shortcomings/vices – anger, selfish desires, greed, ego and undue attachments with virtues (divine qualities) – non-violence, love, forgiveness contentment, humbleness, detachment and equanimity. 1. Observe Fast and Eat Healthy food (Sattvic Food) for purify the body and mind: Eat light and easily digestible fresh vegetables and fruits, nuts dairy product, and drink lot of water. Cook with positive attitude (Prayers) and eat with love as you are nurturing the spirit within (yogic way of fasting). 2. Make Best Use of Your Thoughts: Think positive or neutral but not negative. Do not waste your energy on negative stuff. Your thought will determine your future. 3. Have Good Company: Mingle with divine, inspiring, motivational and wise people. 4. Make Best Use of Your Speech: Speak softly, honestly and without hurting or insulting others. Practice thoughtful silence. 5. Do Not Blame And Criticize: Forgive yourself and others. 6. Practice Righteousness: Follow your Dharma/Righteousness. Help the less fortunate, the weak, and the helpless without seeking or expecting any return. 7. Connect Body, Mind and Spirit: Do Yoga, Pranayama, meditation, Mantra, (True Yoga leads to union with Divinity). 8. Pray: Pray to Supreme Power for well being of all! Express your gratitude to Mother Goddess for Her blessings and wisdom.